I have a 2003 GSXR1000 track bike for having fun on track days here in the UK. The bike came fitted with the Endurance rear and Medium front. These have felt fine to me but as they are needing to be changed I am wondering about getting Medium on the rear and Soft on the front. I'm no racer but I do ride in the fast group (for the UK guys I get round Oulton park in about 1:58 though I believe there is plenty of improvement to come). Does anyone know how much extra grip I might get and how much quicker they would wear out? I've run the same combination on my R6 and from what I have heard from other riders, a soft front won't buy you anything. Thanks for that but I am a bit more concerned with the back. Does anyone know how much more grippy a medium would be? 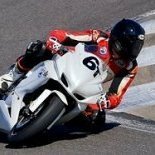 Interests:Motorcycle racing....Living life to the fullest...exercise, exercise, exercise...Music, not all but most...passionate people...Good wine...Good food...Good beer. The 6680 rears are sweet and last multiple track days but the 7704's are worth another 0.5 seconds a lap. I used nothing but the British made N-Tec slicks until I tried the N-TEC USA made 125/80/17 front and the 200/55/17 rear. I love the feel on my 1000 and can put more throttle on earlier. I use the medium compounds front and rear. If youre not racing, Endurance Front and Rear. If you absolutely have to be faster than your mates. Mediums Front and Rear. Endurance last almost about 75% longer than the Mediums. exclusively for street what do you think of Dunlop D211 GP Racer Endurance Front and Rear? the temperature must be in the air they breathe to work properly for each composition in hand? or how to choose the tires depending on the temperature outside? Interests:Erm, motorbikes, cars, triathlons, food, pies, food and cheesecake. You wouldn't notice any difference in laptime performance around Oulton with that tyre difference. Stick with the endurance, it'll save you a few £ on wear. Anything under 2 mins is nicely respectable, but you could easily go sub 50's on that tyre before you'd really notice any difference from a softer rear.